What is it that V users probably really want? 16mp+ BSI sensor, robust mini-DSLR body with hand grip and full controls, built-in EVF. As you can see from the list above, we haven’t gotten all of that in one camera, though the V2 probably came the closest. Why Nikon is scrambling with design I don’t know. Well, I do know: sales volume. Nikon seems reluctant to bring the Nikon 1 prices down and they seem reluctant to let a Nikon 1 directly compete fully with a DX DSLR. Wrong, wrong, and wrong. 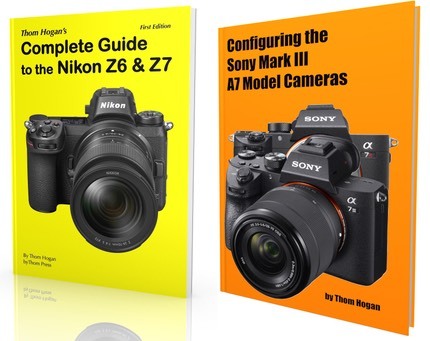 Given the sensor size difference alone, DX DSLRs aren’t going to go away: they have advantages over the Nikon 1 that are exploitable in marketing. Only Nikon has proven most of the time to be woefully inept at marketing. Here we are (again) with a US$1200 camera that isn’t exactly what the likely buyer really wants. A V3 kit (camera, kit lens, grip, and EVF) costs more than a D7100 body, and about the same as you’d pay if you could get the equivalent DX kit lens with the D7100 (18-55mm). So in essence you get a mirrorless camera (V3) that’s less capable in many ways to an equivalently priced DX DSLR (D7100). This makes the primary advantage of the V3—smaller size and weight—have to pick up all the slack to justify the purchase. In the US at introduction, Nikon provided a free FT1 F-mount adapter with the V3 kit, which alters the price equation a bit, but still, we’re talking about an expensive small camera. Not that the V3 doesn’t have some positive attributes. This is a camera that shoots at 20 fps with full phase detect autofocus, for example, and can shoot silently up to 60 fps (with first shot exposure and focus used for all shots). That 171-point phase-detect-on-sensor autofocus system has proven to be the most distinctive trait of all the Nikon 1 cameras, giving them DSLR-like focus performance. Likewise, all of the Nikon 1 cameras are pretty good video cameras, with the V3 having 1080P/60 capabilities in addition to all the regular video settings and some Nikon 1 unique bits, such as Motion Snapshot. While not perfect video cameras, the Nikon 1 models, including the V3, are all very capable as far as small consumer-oriented still cameras go, especially considering the focus system. In terms of the camera basics, the V3 shoots at ISO 160 to 12,800 and can shoot Compressed 12-bit NEF files. These files are generated by a Nikon/Aptina 18mp 1” sensor that has very good properties for small sensors, though a tad behind the Sony 20mp 1” sensor used in a few competitive products. That’s mostly due to the fact that the Sony sensor uses BSI technology to increase the fill factor and the Nikon sensor doesn't. I’ll have more to say about this in the performance section later in this review. Auto ISO is extremely limited, with only three maximum ISO values available to select and no choice of minimum shutter speed. The rear LCD on the V3 is a 3” 1.04m dot tilting touchscreen. Both those last two bits are new. The tilt angles don’t extend all the way to selfie position, but being able to tilt the rear LCD up and down makes the camera more usable for certain situations, such as trying to get a shot over a crowd or setting up macro shots at ground level. The touchscreen, however, is the big step forward, in my opinion. Coupled with the additional controls on the camera, it’s just far faster to get camera settings where you want them on the V3 than on previous Nikon 1 models. Nikon’s use of the touch aspects is not as extensive as some of the competitive products, but that also means they haven’t littered the screen with extra nonsense that you rarely use. For the most part, the touchscreen functions are exactly what you expect them to be: quick settings, menu navigation, touch focus/shutter. For once Nikon didn’t overthink something and got the user interaction about right. The optional and oddly shaped EVF is a 2.4m dot fast refresh one. Unfortunately, early production models have a real issue: the two interlocks that engage the EVF in the camera mount aren’t quite properly made, and getting these defective EVF designs on and off of the camera is a bit of a struggle. I can’t speak to the redone EVF, as I’ve been too busy using my camera to get it fixed by Nikon. Actually, NikonUSA has yet to even acknowledge any issues with the EVF, though Nikon Japan did (and the EVF I received here in the US matches the serial numbers of the Japan advisory). Aside: this is one of the really frustrating things about Nikon recently: they’re just slow to respond to real customer issues, even when they know all about them. Someone at Nikon thinks keeping quiet is the right answer to QA/QC problems. It is most certainly not. The opposite is actually true: you need to be proactive and vocal about them, and show customers that you actually care about their experience with your products. In my view, Nikon has stopped doing that in recent years. Only if we users complain loudly enough will Nikon ever step up and say, oh yeah, there was a problem with that, let us now fix it for you. And remember, I’m a member of NPS (Nikon Professional Services), so you’d really think that Nikon would be trying to make sure we’re not having difficulties with their products: NPS members probably generate more (word of mouth) sales than many of Nikon’s direct promotions do. Besides an optional EVF—which takes up the accessory slot, so you can’t use an external flash or GPS unit simultaneously—we also get an optional grip. (I write “optional” despite the fact that you can only buy a bundle that includes both of them in the US at present. But you can take them off the camera, so they’re certainly user optional.) The grip has several problems to it: it has to be on the camera in order to get the Fn3 button (unfortunately the default for that button is poorly chosen for most users, but you can program it to other things). But the big problem is that it blocks access to the battery chamber. That means that to change batteries you have to take the grip off the camera, exchange batteries, then put the grip back on. Without the grip and EVF (above), the V3 becomes a compact-style bar-of-soap type camera. I suppose there might be times when I might want that, but I haven’t encountered any yet. Thus, my use of the V3—and I think that of many V3 users—is that the grip and EVF aren’t optional, they’re just things that sometimes need to get pulled off my camera (EVF to use a larger flash than the built-in one, grip to change batteries). Flexible does not mean optimal. Another change Nikon made in the most recent Nikon 1 cameras is moving to a microSD card. While we access the card slot via the right side connector door (good), boy are those cards small and easy to fumble while loading and unloading. I’m using larger cards in my V3 than in my D800 for one simple reason: I don’t want to change cards often, because more often than not I end up dropping the microSD, and out in the field that means I sometimes have to hunt for it. Video abilities are reasonably impressive (up to 1080P/60 at 36Mbps bit rate and 720P/120), but can be a little tricky to understand. You can record video at any time (via the red Record Video button), but the camera does a bunch of “automated” things that might confuse you: the screen stays 3:2 but the video is recorded at 16:9, plus the camera will select a Scene exposure mode automatically as well as white balance and ISO. If you move the Mode dial to Advanced Video (the video camera icon), the 16:9 aspect ratio is shown and you have much more control, including the ability to set the exposure manually, control white balance, Picture Controls, and ISO. Most interesting is that the camera can take full frame (3:2 aspect ratio) images while recording video, and do so silently without dropping a frame (press the shutter release ;~). The Nikon V3 is, as I noted US$1200 in the US and only comes as a bundled kit of camera, new 10-30mm kit lens, grip, and EVF. The camera is made in China. I can sum everything up about my days of shooting with the V3 in four words: what was Nikon thinking? The included grip is both welcome and unwelcome. I get a real sense of different teams working on different parts of the kit, and compromises on one team being dictated by decisions made by other teams. For example, the grip gives you a traditional Nikon DSLR front command dial: horizontal, on the front of the grip just below an angled shutter release. Good. But now to make the camera usable without the grip, the front command dial on the camera body has to move to a vertical one positioned close to the lens mount. Bad. I do like the ability to pare down the V3 to a more pocket size without the grip, but now I’m having to change my shooting orientation with the front dial and its position. Also, I have to now keep track of two very small parts (the rubber cover from the camera and the plastic cover from the grip) when the grip is on the camera, or else I end up with exposed contacts with the grip off. The likely purchaser of the V3 is going to want the grip most of the time, both for the better dial/shutter release positions and the hand grip, but also for the additional of the Fn3 button. Unfortunately, that also means taking the grip off to change the battery, a miscentered tripod mount, no real way to mount an Arca-style L-plate on the grip, and oddly, an offset locking dial with an internal cam mechanism that looks like it will be prone to field failure if you’re taking the grip on and off all the time. Already in a bit more than a month extensive use of the V3 I’m having more problems getting the grip on and off than I did when I received it. I’d also guess that any blow against the grip will just make that more of a problem as time goes on. That the battery life of the camera isn’t all that great and the battery level isn’t monitored well means that I tend to always get caught in a rush to change batteries, too. Battery level isn’t shown until the battery is almost exhausted (hint: press the Play button to review a photo to see current battery state). Basically, when the battery level appears in the viewfinder, you’re only a few shots away from needing to replace the battery. Whoever thought that a high-end mirrorless camera didn’t need an always-visible battery monitor should be relieved of their duties, escorted to the front door, and told never to work with electronic components ever again. Seriously. This is one of the real bone-head moves that make the V3 far less satisfactory to use than it should be. Overall, the build quality seems high, though it’s a different kind of solid than the original V1 and more the small DSLR style quality of the Coolpix A. Solid dials. Decent buttons. Metal chassis. But a springy shutter release and the dreaded compact camera Direction pad with wheel. As before, many of the dials are just too easy to dislodge accidentally, even the main Mode dial. I’ve found my V3 not in the exposure mode I left it in far too many times to ignore this. It’s not as bad as the V1, but it’s still not good. The On/Off switch is one of those “not good” things. The location is fine, but it’s a flimsy control that doesn’t have a strong engagement feedback. Moreover, it’s easy to accidentally hit it and turn off the camera, especially with gloves on. You get the optional EVF with the kit, and it appears to be both well made and decently integrated, but it’s still a significant hump on the body that sticks out and can be struck or dislodged. Why Nikon has moved from a fixed EVF to an optional one, I have no idea. It didn’t make the V3 less expensive, it actually made it more expensive. Sure, you can take the EVF off and make the camera a little smaller for the pocket. It very well may be that Nikon did a removable EVF because the J4 wasn’t originally scheduled to be available everywhere. I’m not convinced that integrating an EVF would have made the V3 that much bigger. The humorous thing is that I think Nikon got offended by how many reviewers wrote that the V2 looked ugly. Indeed, the V3, stripped of all its options, looks very nice. Basically a clean variation on the soap bar compact camera style. Put all the options on it, though, and it starts to look…well…ugly again. Or maybe ungainly is the right word. So now the ugliness is optional, but it’s not an optimal optional. Having a tilting LCD is a big plus, especially since the folding option Nikon chose allows the LCD to be pulled away from the body itself and put into some unique and useful positions. Unfortunately for the social crowd, that doesn’t include a “selfie” position (the optional EVF would block that anyway, another of those one team causing decisions by other teams things). One big plus is that the LCD is now a touch screen, and a pretty good one at that. Navigating menus with the touchscreen is fast; you can even scroll quickly. This is good, because the Nikon has the usual sprawling menus of Nikon cameras, even though it doesn’t have as many options as the DSLRs. Still, I’ll give credit where credit is due: I can change settings on my V3 faster and more precisely than any previous Nikon 1 camera. That’s good news for us 1 users, who were frustrated by previous models in changing configurations quickly. I guess Nikon ended up in the position of trying to cram too many things into too little space, because we also get a microSD slot instead of an SD card slot. I’m not a big fan of that decision. Basically it means that Nikon 1 users moving up will need new cards (they’ll also need new batteries), and then they’ll also need to keep track of their SD holder for microSD cards lest they lose their ability to ingest files into their computer. Oh, wait, there’s WiFi in the V3. Unfortunately, Nikon (and all the other camera makers) still hasn’t gotten around to realizing that might be really useful to computer users. Instead, we’re still stuck with poorly designed iOS and Android apps and convoluted workflows. How about this Nikon: add WiFi ingest to Nikon Transfer? Is that beyond your programming capabilities? Apparently. I know I’m getting harsher in my wording about Nikon's (and other Japanese companies’) software efforts, but this is now getting to the realm of ridiculous. There are recent graduates coming out of college that are coding far better work than we’re getting from Nikon, and more to the point, programs that actually do something a user might want done. In Nikon’s case, this is a three stage failure: (1) they fail to recognize user problems that need solving; (2) they create programs that are poorly coded and break easily with virtually any change in the OS; and (3) they eventually give up on code bases leaving users stranded. It’s gotten to the point where I can’t recommend any Nikon software. Frankly, in my Silicon Valley career I would have expected to have been fired if any software effort I was involved in was as bad as Nikon’s efforts have been. Some good news is that we have three programmable function keys (one being the press of the rear command dial), and Nikon has chosen the defaults reasonably well (WB, ISO, Movie Record). Just switch that Movie Record assignment to AF-Area Mode and many of you will be happy, though you might want to move which FN button is which. The bad news is that many of the other camera defaults just aren’t consistent with a high-end shooter’s choices (Auto ISO set to 6400!, Active D-Lighting On, AF-A, etc.). So once again the likely purchaser of the V3 is going to have to spend some time optimizing the camera for their choices. Not a terrible thing, but be prepared to look through every menu option to make sure it’s what you want when you first get the camera. Nikon seemed to take to heart the many reviews that said that the Nikon 1’s menus were sprawling and slowed shooting down. Their answer: a new menu (Image Processing, which has WB, ISO, NR, and Picture Control settings on a one page menu). I both like and dislike this. I like it because it does make it a little faster and easier to get to some key settings (though note that two of those can be controlled by FN buttons now), especially since we have a touch LCD screen that allows us to jump right to a menu. I dislike it because it’s a temporary patch on a bigger problem, and now we’ve got the Nikon 1 menu system deviating from the DSLR menu system (unless this is an indication of things to come on DSLRs). Basically, the menu system still feels a bit disorganized and disjointed, though I noticed that I’m scrolling less and jumping to things faster. So progress, but not perfection. The really good news is that, in shooting, the V3 is pretty much like the previous V models: a good EVF gives you a DSLR-like view while shooting, the focus is DSLR-like once mastered, metering is excellent for a small camera, you still have incredibly fast frame rates available (20 fps with focus, 60 fps without), and you can go completely “silent.” If anything, the addition of the FN buttons and command dials make the V3 even more DSLR-like, which is a good thing, IMHO. While Nikon didn’t take a direct route to get there, the V3 shoots and handles more like we wanted the V1 to back when the Nikon 1 was introduced. Yet I still can’t get over the impression that the camera is a bit of a kludge: the non-integrated EVF and optional grip are a step backward. The grip and EVF aren't optional for my shooting, and they introduce weak points I need to watch while handling the camera, something I never feared with the V1 (other than that darned move-by-itself Mode dial). The really bad news is that Nikon still doesn’t get that we want Speedlight compatibility and control with the V cameras. The Nikon 1 flash system is seriously limited, and now we’re even more limited if we want to use the EVF, as it means all we have left for flash is the wimpy little pop-up, which can’t command an external flash except by putting it in complete manual mode to trigger “dumb” slaves. I’m going to quote former company president and now board chairman Makota Kimura: "we need to question our ability to offer truly innovative functions and performance.” Uh, Kimura-san, could you have a talk with the Nikon 1 design team? They don’t seem to have gotten your messages about this. Flash, in particular, is an under-performing function that doesn’t even use Nikon’s current innovations. As I was finishing up this review, I got an email from a long-time Nikon professional who’s well known in a major city. He had just bought a Nikon J1 to play around with and sent me this message: “I’ve spent literally 20 minutes and CANNOT set shutter or aperture. Took 10 minutes to even get to Manual mode and even there I cannot change shutter.” I present that here to highlight a potential bit of good news, as the V1 was pretty much the same as the J1 for that kind of setting: I doubt he’d have that problem with the V3. With the dual command dials and a real Mode dial, those types of problems are things of the past if you’re a Nikon DSLR user. So in one sense, Nikon has done what we’ve asked, and made the V cameras much more like a DSLR in how we set and use them. But it’s not been a smooth ride, as there are all those little things I note above that can be nuisances. Battery: We’ve taken a step backward. The battery in the V3 is smaller and has a low CIPA rating (310 shots/charge) for a serious camera. As I noted, you’ll get little warning about the battery getting ready to be exhausted. In more than one case during extended shooting this happened in just a couple of shots. Given that I’ve been shooting sports with the V3, that’s bad news. I get almost no useful warning that I need to switch batteries between plays/action, and at least three times have shot to exhaustion during a key play. I also can’t quite figure out the battery life in general. In general shooting, several times I’ve gotten lower than 250 shots, once above 400, and the rest close to that CIPA figure. When shooting with the electronic shutter at 20fps, I’ve gotten as high as 1400 frames. That’s a pretty wide variation. Using VR is one thing that comes into play, especially if you’re using F-mount lenses on the FT1 adapter. Using electronic shutter with bursts tends to preserve battery life as the camera seems to not draw a lot of power when it’s actually shooting. So I suspect that it’s EVF/LCD use that’s hurting my battery results. Often in testing, I’m using the LCD and reviewing and setting things far more than I tend to do in regular shooting. Still, I haven’t been able to find all the factors that would give me better predictability in battery life yet. I suspect that the mechanical shutter also uses a fair bit of power given that I’m seeing better battery life in continuous shooting than single shot shooting. So here’s the thing: carry extra batteries. No problem with that except…yep, you’re pulling the grip off the camera every time you change the battery. Even that 1400 images shooting bursts becoming problematic. That was probably about 75 bursts (most about a second). So I pressed the shutter release 75 times during a swim meet and…had to change the battery. That’s one reason why shots-per-charge numbers are like EPA auto mileage estimates: your use may vary. Considerably. Battery switches aren’t instantaneous if you’re using the grip, unfortunately. Someone needs to make the following product: a low grip (the Nikon one extends above the top plate; we need one that is low enough so that we can reach the front dial) with an Arca-Swiss plate across the bottom (though this will be a little wide), and a slot through which the battery door is still accessible. Do we need the front command dial, extra shutter release, and Fn3 button? Probably not, but we absolutely need the hand grip position. I’d put a third-party rubber grip on the camera (ala Franiec), but Nikon’s put just a small ridge on the camera front itself, thinking that’s enough for a secure grip. It isn’t. So current glue-on grips won’t work. So the battery longevity issue is more of an issue because of the optional grip that most people won’t find optional. Autofocus: Still pretty much the same old Nikon 1: fast and reliable autofocus in good light, slight stuttering in very low light when contrast detect has to be used. Nothing significant got changed here that I can see, and it’s actually amazing to have DSLR-like focus performance at 20 fps. However, I will say this: I think that telephoto work is no longer always as precise as it was with the 10mp and even 14mp sensor versions. What do I mean by that? Well, it has to do with subject detail density. I first noticed this with the 30-100mm lens, but I also notice it with the 70-300mm lens: focus can sometimes hunt or be slightly off with the phase detect system. I don’t notice this with wide angle lenses, or even the 32mm lens. What could be going on? Simple: the smaller photosites on the sensor mean smaller phase detect areas. If a distant subject doesn’t have good detail in it (grain, feathers, blades of grass, etc. ), I’m guessing that the smaller focus detect sensors are having a tougher time seeing something they can focus on. This isn’t a big problem, but I am noticing that with lower contrast and less detailed subjects and really long telephoto use, I’m not nailing the focus quite as often as I did with the V1 or V2. Say 10% less to try to give it a value you might understand. Since I’ve separated focus from the shutter release by using the AF On variation on the V3, I have to carefully watch what’s happening when I do focus at 300mm via the EVF. The 70-300mm, in particular, has a tendency to do a last second push/pull to verify the focus, and it’s missing every now and again. This was true of the older V’s, as well, though I usually didn’t see it unless I had 400mm or more mounted on the camera, and again, they didn’t do it quite as often as the V3 seems to. Unfortunately, the EVF isn’t quite up to the job, either: it needs a bit more definition, especially if light is low, in order for me to be 100% in evaluating focus visually. So I’m chimping shots a bit more with the V3 than I used to with the V2 to make sure I obtained decent focus. Here’s my advice: if you subject is low in detail or low in contrast, trust but verify as it concerns focus. Image Quality: I spent a lot of time comparing very low level details of raw data for the V3 versus the Sony RX-100 Mark II (the Mark III uses the same sensor). This isn’t easy to do considering that we have fixed lens versus interchangeable lenses: the lens can get in the way of seeing what’s going on with the sensor. Still, after a lot of exhaustive study, I’d say the bottom line is this: the 20mp Sony 1” sensor is better than the Nikon 18mp 1” sensor, and by a meaningful margin in some cases. At the same marked ISO value, the Sony is about a quarter of a stop “faster.” Neither are close to their marked value. Thus, at marked 200, the Sony might be real ISO 140 and the Nikon 120. The Sony definitely produces more dynamic range at the lower ISO values (up to about ISO 800). At ISO 200, which is where I’d shoot the Sony, the useful advantage may be two-thirds to a full stop (DxO measures it higher, but I’m judging by my noise floor target). The net of those two things is this: I’m applying less noise reduction on Sony RX-100 images than Nikon V3 images at low ISO values. Wait, what? I’m applying noise reduction at low ISO values? Yes, generally you need a tiny bit of NR with small sensor cameras. Photons are random, so if you’re not collecting a lot of them (smaller electron well in small pixel, small sensor), shot noise starts to intrude, particularly in deep shadow areas. We’re already dealing with a reduced dynamic range (from large sensor DSLRs), so often I find my shadow areas need a slight touch of NR unless they are highly detailed (at which point the noise disappears and tends to become just faux detail, which is acceptable). I was curious about this, so I went back and re-evaluated some V1 images versus the V3. Sure enough, the larger photosites of the V1 gave me just a bit more dynamic range and a bit fewer noise issues (and I want to emphasize “a bit”). Moreover it was about a quarter of a stop better in ISO at any given setting, too. Okay, so what does all that mean in a practical sense? For Nikon 1 users, we’ve gotten more pixels in exchange for a small loss in ISO and dynamic range with a small gain in noise. You may remember my V2 review, where I mentioned that I found the V2’s image quality “coarser” than the V1’s. That’s still true with the V3, plus we’ve lost a bit of light gathering ability (quarter stop). The operant question is whether that is meaningful in shooting. For most folks’ use of a Nikon 1, probably not. For Internet use and modest print sizes, I just don’t see there’s enough decline to worry. Indeed, if you’re printing at 8x10”, the gain in acuity from downsizing the V3 image is probably more than enough to offset the losses. If, on the other hand, you were looking for a really small camera that you could shoot landscapes and print big with, well, then we might start to have some issues: m4/3 would be a better choice for this type of work, and APS or full frame are really what you seek. ISO 160-400 — Use at will. Some noise is present, typically in deep shadows, but usually easily dealt with or ignored. ISO 800-1600 — Discretionary. Noise will almost certainly have to be controlled, and that will result in some loss of detail/edge acuity. ISO 3200+ — Only if unavoidable. The color noise becomes clearly apparent, which makes noise reduction much more difficult and tends to result in that fake edge effect when applied. You’ll clearly lose detail/edge acuity if you shoot at these ISO values. I probably spent far too much time trying to overanalyze this, but it’s part of the dilemma of who Nikon is really targeting with the V3 (and for that matter, other Nikon 1 cameras). When you start targeting more sophisticated users, they start worrying about these image quality details, especially when you charge them US$1200 for the product. Given that Nikon’s 1” sensor in the V3 is not the best-in-class performer, we have a bit of a disconnect here. Which adds to all the other disconnects in the camera. That’s not to say you can’t get great images from the V3. I can and I have. Ones that hold up well at 13x19”, even when shot above base ISO. But you’re not going to get deep dynamic range from this camera. We’re back in the middle of the DSLR era in terms of that, though with more pixels in a smaller product. I could have used a lower shutter speed and lowered the ISO given that I was using an f/1.4 lens. But then you wouldn’t have seen what’s happening at my usual ISO 3200 value. Not bad, actually. Quite usable, despite my dialing down the shutter speed to 1/250 (I was testing some aperture/shutter combos at the time). Shoot at will from ISO 160 to ISO 400, but remember that ISO 400 is much more like ISO 250 in reality. Yes, you don’t have full frame levels of dynamic range and your underexposures and deep shadows may have some noise you need to gently filter out, but I find image quality quite good with a little bit of care in post processing. ISO 160 produces the best quality the camera can produce if that’s what you seek, and it’s just a bit shy of actual ISO 100. ISO 800 to ISO 1600 is about as high as I really want to go most of the time. Curiously, we don’t have an Auto ISO setting of 1600 available, a mistake Nikon has repeated for three generations of Nikon 1 cameras. Shooting at these values will require post processing noise reduction. ISO 3200 and above should be avoided unless you absolutely have to shoot at them. You’ll get color drift and blockage and enough noise that noise reduction will clearly take out detail. Your ability to crop or take the image to large outputs is compromised. So what about JPEGs? Nikon does a good job of mitigating noise and color issues in the JPEGs, as usual. But they also tend to be a bit softer than you get out of camera than from other camera brands. Generally I can get somewhat better results by carefully processing raw files, but that takes time and knowledge. Had Nikon made the V3 with an integrated EVF, a permanent grip, and a heftier battery, then priced the body at US$899 with the FT-1, I think we’d be in the territory where current Nikon 1 users would be rejoicing and more users would be joining them. Such a product would be a big hit. At the current pricing with the awkwardness of the options, I’m not sure the value is fully there for anyone but the dedicated Nikon 1 user. Which brings me to the FT1 that Nikon threw in at the last minute in the US package for a limited time. This makes Nikon DSLR users consider picking up a V3 for long telephoto work (due to the 2.7x crop factor). A V3 puts 18mp in that crop factor, for the highest pixel density we currently have available. However, why wouldn’t you just buy a D7100 body at this price? You get a little less pixel density, but you get a better camera and better image quality. After using a D7100 side-by-side with mirrorless cameras in the Galapagos in April, I came to appreciate more and more what the D7100 can and does do in the right hands. If you’re going to price a camera at US$1200 or more, you’re going to have to beat the D7100. The V3 just doesn’t do that. Short battery life, no flash flexibility, conflicting design choices, and a few other quibbles all conspire against the camera. The small sensor, while performing at or above expected level, doesn’t come close to hanging with the DX crowd, either. Sure, the V3 is smaller than a D7100. But we’re paying huge penalties for “small” these days. Thus, it’s difficult to put together a value proposition for the V3. The V3 is expensive, it has faults that impact shooting (still), it has a small sensor that is being asked to play against much bigger ones, and the overall package is still a little shakier than it should be in terms of all the parts adding up into a sum greater than the parts. We’ve taken some steps forward from the V1 and V2, some backwards. It should all be steps forward. That’s not to say there won’t be takers on the V3. Indeed, Nikon just apologized in Japan for not making enough of them to fill current demand (though demand isn’t all that high, it’s still higher than Nikon apparently expected, which shows you what they thought of the camera’s marketability). I’ll find a place for it in my gear closet, despite the fact that I’m in the midst of trying to clean that closet down to just the basics I want to shoot with. The good things about the Nikon 1 V series remain: it’s a more-than-competent compact camera replacement in one respect, it’s the only mirrorless system that can focus and shoot fast and randomly moving subjects with reliability, and in good light with the right lens (possibly plus the FT1) it becomes a wildlife shooter’s delight. I just wish that Nikon had put a bit more refinement into the design decisions and finally made the V series what we all wanted in the first place. Fix the grip. It needs a knockout to get to the battery compartment without removing the grip, it needs a wider base for use with plates or on tripods, and it currently precludes using the camera with an L-plate of any kind. Make the EVF fixed. I’d rather have a fixed (or pop-up) EVF than the internal flash, especially given that the better flash choices all require use of the accessory slot, which the EVF takes up. Add BSI to the sensor. Nikon is now behind where Sony is with the 1” sensor in terms of image quality, specifically in the one thing a small sensor needs: more dynamic range. Drop the button overload on the Direction pad. Unfortunately, even with three FN buttons, the V3 is still a few buttons shy for full control without menu dipping or touch screening. And the hand position is such that your right palm will hit the exposure compensation side of the Direction pad. Worse, exposure compensation isn’t reachable by the touch screen controls. We need at least one additional button, probably two, and we need the Direction pad de-buttoned (or programmably buttoned). Make the camera more weather and abuse resistant. Too many “cheap” parts on the V3 and not enough gasketing. A camera that costs this much shouldn’t be something you have to coddle, and I have already learned I have to coddle my V3 more than my V1 or V2. Make the price match the value. US$1200 is not the value point for this camera, even fixed. US$800-900, maybe. In the end, we’re not a heck of a lot closer to where we want the V series to be than we were with the V1. The V1 didn’t have enough external control, but it had body integrity and durability and not all these finicky add-on parts. I’m not sure why Nikon is making such tradeoffs. They weren’t needed, really. They’ve now engineered three different body designs in just over three years, but they haven’t moved the bar very far. To be fair I should point out that I still shoot with a V3, despite all my negative comments, and I’m taking it to Africa this summer. It delivers some things that you just can’t get anywhere else. But it’s still a camera that’s more frustrating to use than it should be. Obviously I’m putting up with the frustrations to get the benefits, but there shouldn’t be any frustrations at this point. Even Microsoft tended to get things right with version three of a product. That you’re okay with the image quality it produces and don’t really need high ISO work with the camera. That you either don’t mind shooting without the grip or you don’t mind taking it on and off every 300 shots or so. That you don’t mind a cramped hand position (even with the grip) and the occasional nuisance of hitting the Direction pad or something else (the touchscreen in certain case) and then dealing with what happens when you do. That you’ll be highly restricted in regards to flash capabilities due to design compromises and Nikon’s lack of CLS support. That you don’t mind paying premium price for something that doesn’t really feel premium. Yes, I’m being harsh. When a student kept making random mistakes in my University classes and didn’t pay attention, I got progressively tougher on them until they did (or dropped ;~). That’s the way I feel with Nikon and the 1 series at this point. The original models had two promising elements: a sensor that over delivered for its size during that time period and focus that was in the DSLR realm. It also had tank-like build quality. Everything else was mostly a mess. You’d think that two complete redesigns would have reduced the number of nuisances to very low levels, but it hasn’t. So I’m not letting Nikon off the hook with the V3: a V4 still needs to clean up on-going problems with the design. Firmware bits. The battery indicator is a good example here. Too many things seem like they were simplified a bit too much, and we’re missing some things that would be highly functional, such as Save/Load settings. And where’s Auto ISO 400 and 1600? Quality bits. We’ve got some flimsy controls on what looks to be a fairly sturdy body. The shutter release is mushy and has some slop, the On/Off switch cheap, and the Direction pad seems lifted off a Coolpix. Design bits. The grip/battery situation is just a face-in-palm error. Ditto the flash/EVF situation. I can point out more examples in each of these areas, but at US$1200, we’ve just got too many critical problems that were created by the designers. Given the quick turnaround from V2 to V3, I have to wonder whether the V3 was rushed to market, but if so, why? We Nikon users need to show some tough love to Nikon: we like Nikon 1, but it’s about time Nikon got it right. There are just too many rookie mistakes made on this camera for me to wholeheartedly recommend it. On the other hand, it still has many of the attributes we liked in the original and the external control problem is (mostly) fixed. So I use it, but frustratedly so. Of the three mirrorless cameras I’m using these days, the Nikon V3 is the most frustrating. And all are more frustrating than the D7100 and higher end DSLRs. So, those of you asking “are we there yet?” No, we aren’t. Father Nikon seems to be lost and afraid to ask for directions. That said, I am using it, and it’s much more a mini-DSLR than the V1 or V2 were. So we’re taking steps in the right direction, just not fast enough or far enough. Let’s start with the US situation. In the US, you can only buy a V3 in kit form, which includes the body, a new 10-30mm lens, an EVF, an extended grip, and an FT1 adapter. The cost of this kit is US$1200, or more than a D7100 body. So the very first thing you have to ask yourself is did you get more than you’d get with a D7100? Yes, you got a lens. Which brings us to the lens: it’s a fly-by-wire zoom (no mechanical coupling of the zoom ring). The hysteresis of the wired ring is pretty good, better than many: it zooms fast if you turn the ring fast, slower if you turn the ring slower, and the delay is small enough to mostly ignore. Optically, it’s fine. The problem is that this new lens is a truly consumer lens on a camera being priced professionally. Want to use filters? You can’t. Want to use a lens hood? You can’t. Plus you have the slight wait for the lens to extend when the camera is turned on. In other words, a total mismatch of product feature to customer. At US$1200, I want a prosumer level camera and I want to use prosumer lenses. This lens doesn’t add value to the kit, it subtracts value. That said, the 70-300mm is a powerful reason to consider the V3. Only I think you’ll always be shooting with the EVF and grip if you use that lens, so why those parts are “optional" I don’t know (as is the tripod mount for the lens!). Which means that the V2 looks like a good match to the 70-300mm ;~). Again, I’m thinking that the left hand at Nikon doesn’t know what the right hand is doing, and then it all has to come together at the end and we get these silly compromises. 2018: this model is out of production and no longer available new. But used copies can easily be found.